Skincare is my FAVORITE aspect of beauty. 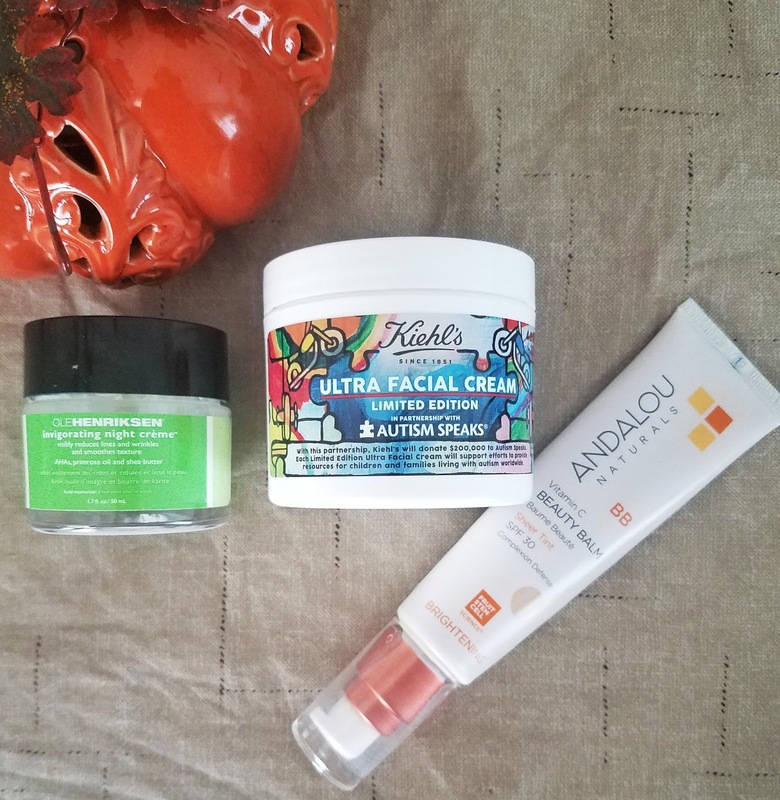 So I switch up my skincare routine often...mostly because I like to try new products. BUT this time, I had to. My skin has gone from super oily most of my life, to combination leaning towards oily over the past few years, to now becoming dry. I still have acne prone skin that breaks out (REALLY?!) but now my skin needs more moisture than ever. And finding moisture that is "enough" but doesn't clog my pores and break out my skin? That's difficult! 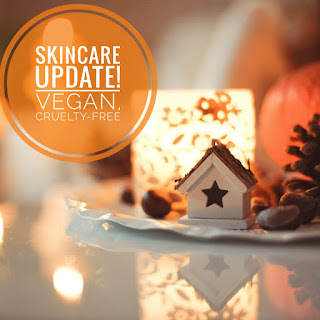 On top of those challenges, I've also been making an effort to find more cruelty-free products. Through that, I've been trying more "natural" products. But here's the thing, natural or not, if a product doesn't give me the results I want, I won't use it. So... through much trial and error, here are the products I've been using regularly. And if you thought my skincare routine was a little extra before, you're going to see I've only added to it. I don't know how long this routine will last, but my skin has been loving it. One of the first things I had to do was cut out my salicylic acid cleansers. Now that my skin is drier, they seemed to just cause more harm than good. I first started with Perfectly Posh's That's So Cuke! foam cleanser. It's refreshing, gentle, and gives my skin a nice clean feeling without leaving it tight and dry. As I started trying more products, I changed my routine to using Perfectly Posh's Bright Young Thang in the morning (with my Foreo Luna Mini) and using Neutrogena's Pore Refining Exfoliating Cleanser at night. Bright Young Thang is creamy and moisturizing without being greasy. After 3 uses, I noticed a big change in how my skin looked and felt. It was smoother, more even toned, and a tad brighter. This cleanser is also from Perfectly Posh's Look Natural line. So the scent is light and there are no artificial dyes. The Look Natural line also tends to be great for sensitive skin. I was surprised I liked this cleanser to be 100% honest. Normally my skin doesn't get along very well with Neutrogena. Yes, they have a few products here and there that my skin tolerates. But typically, the brand just isn't one of my go-to's. But I decided to try this cleanser because it has glycolic acid. Glycolic acid is one of those hit or miss ingredients for many. I've known for years that it works really well with my skin. For me, it heals and prevents breakouts, evens my skin tone, and brightens my complexion. But for others, it can be too harsh and dry out the skin. 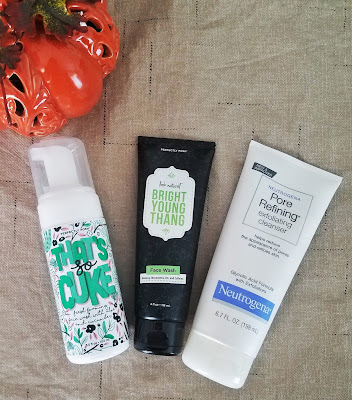 And even though I do like this cleanser and use it nightly, there are times when I do need to take a break from it and use the That's so Cuke instead. Just to avoid drying out my skin. Next, I added two things into my routine: Toner and serum. During my Proactiv days, I used toner regularly (and I really loved Proactiv's toner by the way). But eventually, I phased that out of my routine. I just didn't feel like doing it anymore. (That's what I mean when I say 'we'll see how long this routine lasts.') 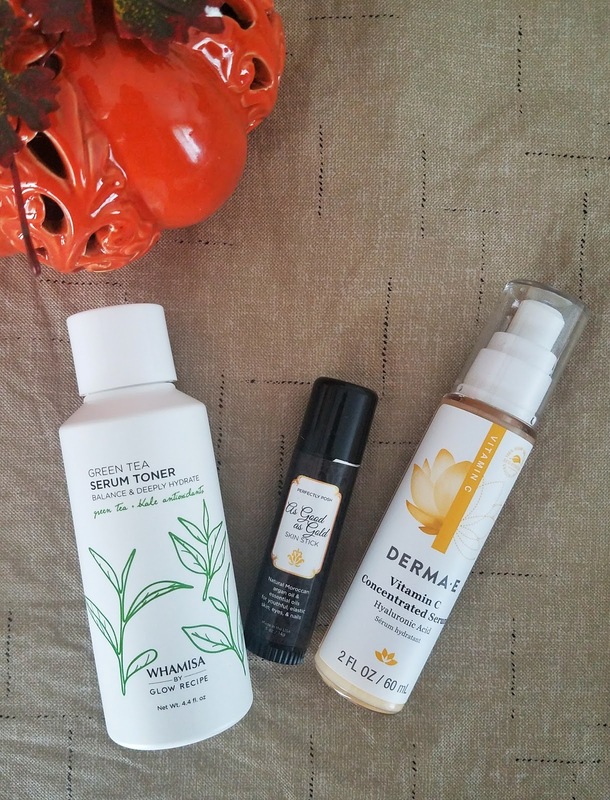 But I saw this Green Tea Serum Toner by Glow Recipe and I was intrigued. Glow Recipe is a beauty brand located in the US that focuses on creating Korean beauty products using natural ingredients. Their products are cruelty-free and also free of Triclosans, BPAs, Parabens, Hydroquinone, Tar, Benzophenones, Talc, Aluminum, Laureth Sulfates/Sodium Lauryl, DEET, Formaldehyde, PABA, Toluene, Camphor, Phthalates and Microbeads, and PVC. Their products are pretty affordable (especially considering the quality) and can be found at Target. The Green Tea Serum Toner got my attention because I know my skin tends to like products with green tea. I had also already tried (and loved) their Green Tea Clay Mask, so I figured this was probably a good bet. And I was right. It definitely does dry down like a toner but there is a smoothness to it. It leaves my skin very soft instead of squeaky, tight, or dry like most toners do. So this is a completely new step for me. I've never really used serums under a moisturizer before. My skin was oily so I never really felt the need to. But when I started trying to figure out how to combat the dryness my skin was experiencing, a serum seemed like a logical choice. I chose this serum because it had really great reviews. And I can see why. First off, it smells like Fruit Loops. Yes, the cereal. It doesn't sound like that would automatically be a good thing...but it is. I typically don't like scents in my skincare. But this one is refreshing and not at all overpowering. I LOVE how this makes my skin feel. Super soft, doesn't break out my skin, and it makes it much easier to put my beauty balm (we will get to that) on. I use it in the morning and at night. And it seems to have added moisture without feeling greasy or causing a shiny look. We're almost done! After the serum, I put on my moisturizer. 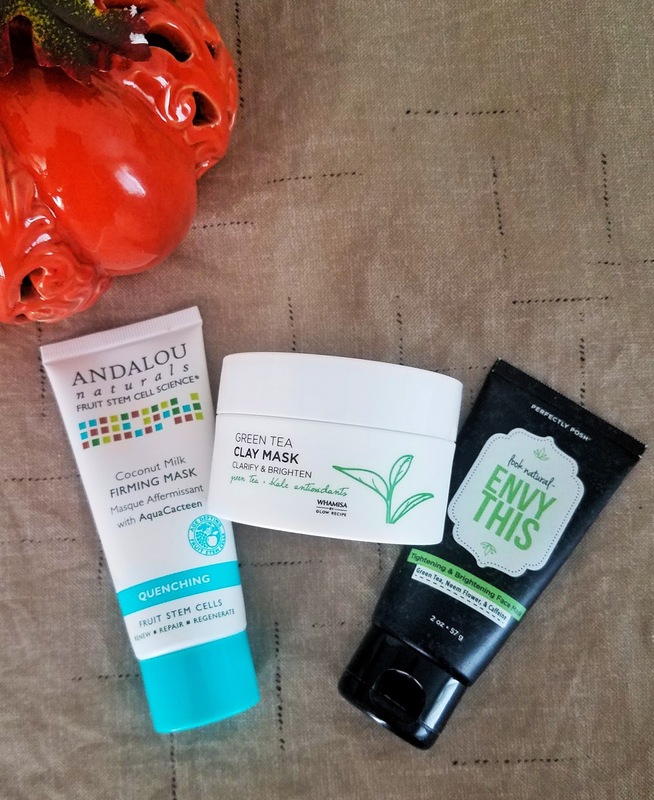 During the day I use Andalou Natural's Beauty Balm. At night I switch off between Ole Henriksen's Invigorating Night Creme and Kiehl's Ultra Facial Cream (I have the Autism Speaks Limited Edition packaging). I wasn't too sure about this one when I first tried it out. First off, I was expecting it to have the texture of a moisturizer like a BB cream. But it truly is a balm. I also have to really work it into my skin to get it to absorb. But once I got used to the texture, I really started to love this beauty balm. SPF 30 is hard to find in skincare moisturizers. And one that doesn't cause an extreme break out on my skin is even harder to find. It does work as both a moisturizer and a primer. It smooths out the look of my skin when applied. Full disclosure: I did not pay full price for this night cream. I found it at Marshall's for $12.99. If you're going to try new skincare, check your local discount stores first to see what they may have. And if you see anything you may like from Ole Henriksen - grab it! I LOVE this brand. I've tried a few of their face masks in the past and their products just seem to work. This cream has AHA's in it - including glycolic and lactic acid. So you know why I picked it up initially. This cream makes my skin glow and, as a bonus, quickly heals any breakouts. I use a very small amount each time. It doesn't take a lot of product for this cream to be effective. Though I do use this cream most nights, I don't use it every night. After a few nights of use, my skin craves more moisture. I use this cream when my skin needs a break from the Ole Henriksen's cream above. I love it because it's moisturizing, not greasy, and unscented. It's seriously a very simple face cream. I would recommend this one to anyone who is just starting to use night cream and not really sure what their skin's needs are yet. This really isn't a cream. But it's what I use under my eyes every night. It's super moisturizing so I only need to use a little bit each night. It also doesn't irritate my skin or give me those little white bumps that I get from most eye creams. I've already repurchased this twice! If Perfectly Posh ever discontinues this, I don't know what I'll do for my under eyes. They are the best part of skincare in my opinion. Envy This by Perfectly Posh has become a tried and true. I love this mask. It's a little moisturizing, refreshing, and "brightens and tightens" my skin. My skin tone is visibly more even after each use. This was the first product I tried by Glow Recipe. I saw a video reviewing face masks by YouTuber Ingrid Nilsen and she mentioned how this mask was the only drugstore face mask she really liked. I made a mental note and when I came across the Glow Recipe section during my next visit to Target, I purchased the mask. I tried it that night and immediately saw why Ingrid loved it so much. It makes my skin glowy and silky smooth. Even taking the mask off is a different experience than usual. Although it does dry like many other clay masks, the way it washed off felt different. As soon as water hit the dried mask on my face, it turned back into its original creamy goodness for a very soothing experience. I'm so glad I watched that YouTube video! This was the first thing I bought when I realized my skin was drying out ("Why does my skin always feel like it's burning?!") It is very soothing and does add moisture to the skin. Is it super hydrating? It wasn't for me. It's a light mask that smells good and did seem to calm my skin. It didn't cause a breakout and after I used it my skin stopped feeling like it had a million little paper cuts all over my face. Thanks for the valuable information you have provided to your article. I to follow some of these steps to make make skin look brighter. But I am to using skin brightening cream dermology it brighter the skin and whitens it up to get the celebrity look.